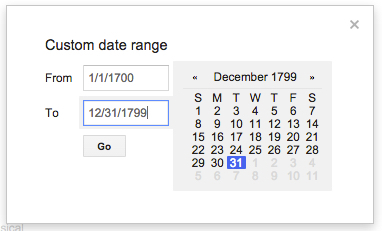 Search Challenge (8/26/15): Know how to create a timeline? ... but the plain old timeline is still incredibly useful for organizing a collection of events that happen over time. For instance, here's a timeline showing the history of Macs (you can click on it to see in full-resolution). Macintosh History in one timeline. 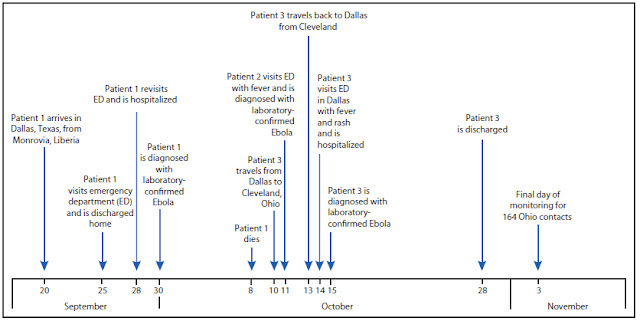 Or you can start to see patterns in the sequence of events, as in this chart from the CDC about the course of events in patients with Ebola. There are many different kinds of timelines, each style with its own advantages. Every so often it would be great to be able to make a timeline of your own from a set of events that you care about. I needed to do this the other day to make a sequence of events clear. "Aha!" I thought, "I'll just make one in my handy-dandy illustration app." So I stopped drawing lines and putting times into the sketch, and opened up my search engine. Guess what? I found several timeline generation tools out there. I just converted my data into an acceptable format (which took almost no time at all) and voila! I had a timeline very shortly thereafter. Even better--it was an interactive timeline--you could scroll back and forth or zoom in and out. This brings me to today's Challenge: it's only nominally a Search Challenge (although there's some of that here), but it's a sensemaking tool Challenge. 1. Can you find an online tool (or app) that will let you take a collection of events (both points in time, and periods of time) and create a timeline? The idea here is that as SearchResearchers, we sometimes need to step back and realize that using a tool to help organize information is a really great thing to do. Databases are one kind of organizing tool (we'll cover a problem like that in a future SRS Challenge), but other kinds of info visualizations can be just as useful. Of course, it would be great if you searched for your own data set, but if you'd like to get started and don't want that hassle, here's a Google Spreadsheet for you with Events from the Viet Nam war. Note that some of the events are time periods (a month, or a year), while others are exact days. Answer: Why all the crazy capital letters? Printed copy of the Declaration by John Dunlap, 1776. Source: Library of Congress. 1. What's the story with the Capital letters in the 18th century? Were they just throwing in caps at random, or is there a Rhyme, and Reason to their capitalization? I started researching this one by looking at the original version of the Declaration and a few other, different but contemporary copies. Here's one: a 1823 William Stone facsimile of the original Declaration. Stone may well have used a wet pressing process (that is, he pressed a contact sheet onto the original, removing traces of ink from the original document for the purpose of making the engraving). I started here because I wanted to see how consistent their capitalization practices were. As you see, I've marked in pink all of the caps that seem arbitrary to me--the C in "Course," the L in "Laws" and so on. But notice the p in "people" of line #1? (The yellow rectangle above.) 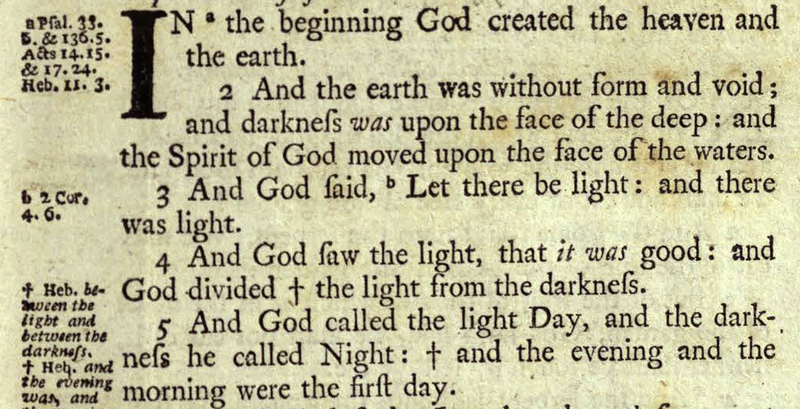 That's capitalized in preceding printed version (from 1776). If you compare the original written version with printed versions, it's clear that the capitalization pattern isn't very consistent. 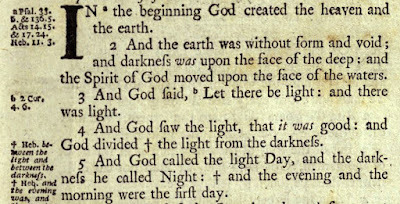 1774 Bible from St. Andrews special collections. 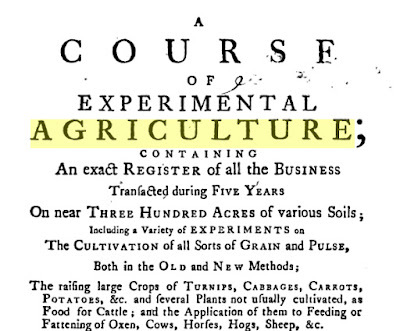 1770 book by John Dove, Strictures on Agriculture. 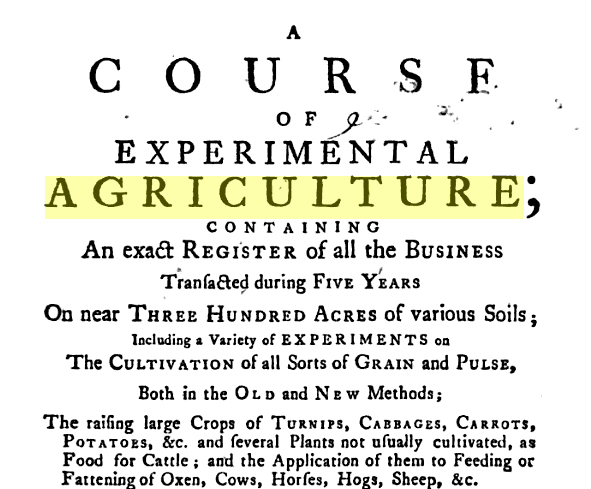 1774 book by Arthur Young on "A Course of Experimental Agriculture"
I got these all from Google Books as a way to get to some original content. I just did a search for [Agriculture] since I knew that this was a topic that has been written about for hundreds of years, then I time-restricted the books to particular centuries. Doing that repeatedly gave me all of the samples from above. By comparing different editions of the same book (or the Declaration), I found that capitalization practices varied quite a bit over time, and even across editions. (For that fact, spelling varied as well. On the tenth line from the bottom. Jefferson spelt British with two 'T's. It's rendered in the more current spelling elsewhere. 'Neighbourhood' is written in the English form with what we consider an extra "u." Later versions of the Declaration have standardized the spelling and (to an extent) the capitals. In other words, there aren't strict guidelines, but the capitalization was more a typographic means of expressing emphasis. leads to a wealth of resources, one of which was the Wikipedia page on Letter Case, which told me that "Other languages vary in their use of capitals. For example, in German all nouns are capitalised (this was previously common in English as well), while in Romance and most other European languages the names of the days of the week, the names of the months, and adjectives of nationality, religion and so on normally begin with a lower-case letter." 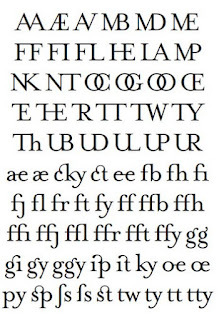 Traditionally, certain letters were rendered differently according to a set of rules. In particular, those letters that began sentences or nouns were made larger and often written in a distinct script. There was no fixed capitalisation system until the early 18th century. The English language eventually dropped the rule for nouns, while German kept it. David Foxon's 1991 Pope and the Early Eighteenth-Century Book Trade is the canonical Work on this Topic. As to when the rule of capitals for nouns was inherited into English, that perhaps can never be known. Since German capitalizes every noun there is speculation that this rule has been inherited from there, perhaps via Johannes Gutenberg and his famous printing press via the Gutenberg Bible (note that the Gutenberg press is not the first of its kind as the Chinese and Koreans already had this technology as early as 1000s). 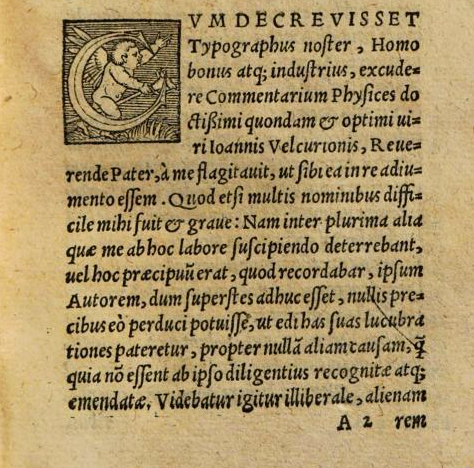 This could be where the Germanic rule of capitalizing nouns may have originated since the Gutenberg (and subsequent presses) were all German in origin and their language and grammar rules may have influenced the rules of printed words far and wide. 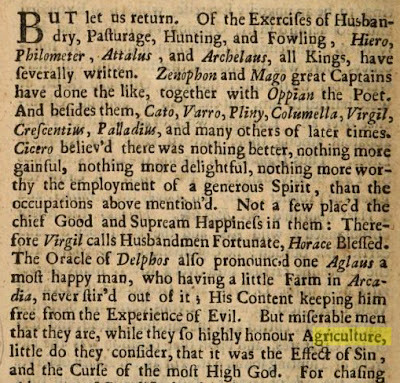 Capitalized nouns were a common occurrence and can be seen in many instances prior to the 1730s and seems to be a shift at this point. 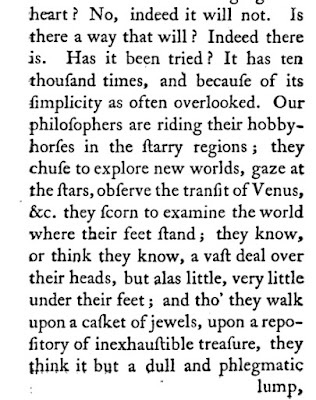 From this first issue of the Gentleman's Magazine published in 1731. Every noun has been capitalized. This heavy use of capitals seems to be common especially in the printed word. 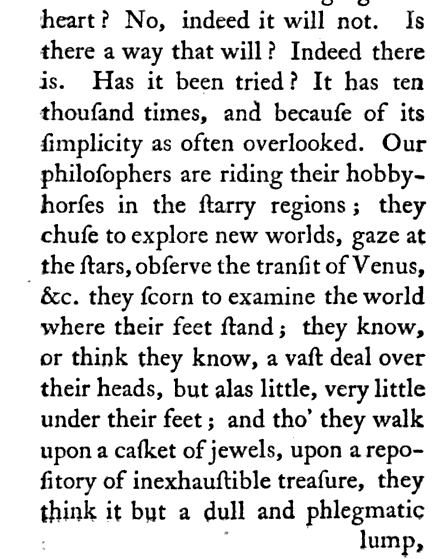 David Foxon wrote in his book entitled Libertine literature in England, 1660-1745 that "... the vogue for heavy caps may be associated with the eighteenth-century culture of sensibility." Also, "Heavy caps also seem to be associated with the more chatty, conversational style of prose that comes into fashion in the late seventeenth and early eighteenth centuries." 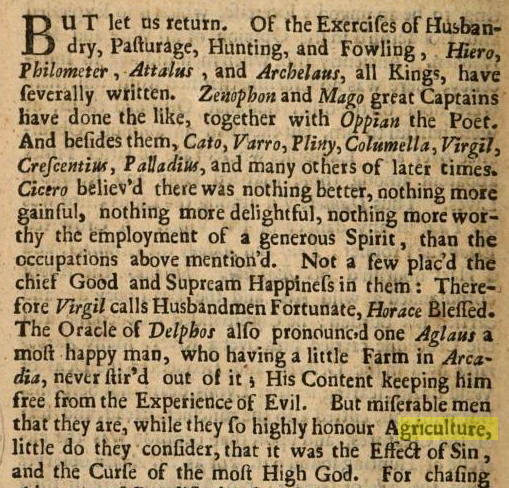 There is a steady drop of capitalizing every noun as can be seen by this volume of the Gentleman's Magazine printed in 1744. This starts to look familiar with printed and accepted usage by today's standard. led me to the Wikipedia entry on Capitalization, which has an extensive listing of the differing practices. Oddly, while acronyms have historically been written in all-caps (e.g., NASA), British usage is moving towards capitalizing only the first letter in cases when these are pronounced as words (e.g. Unesco and Nato), reserving all-caps for acronyms made up of pronounced letters (e.g. UK and USA). 3. What are those funny connectors between characters? What are they called, what pairs of letters have them, and how can I get those on MY computer? Notice that ligatures also include letters that overlap (such as the OC combination above) and letters that blur together (like ӕ). Now, how do I get these in MY documents? The simplest way when writing on the web (such as, when I'm writing this blog), is to find an resource that has them all. The truth is that I tend to use a specialty app (like Illustrator or Word) to get the character, insert the special character in a blank document, then copy/paste it to my target document. This gives a good deal of control over what kind of character you get. 1. Have a font that includes ligatures. You probably already have several, even if you don’t know it. Explore a bit and you'll quickly discover which ones have them (big hint--they tend to be older fonts such as Palatino Linotype). 2. In Microsoft Word, click “Insert" then "Symbol." 3. On the “Symbols” tab, there should be a “Subset” dropdown list on the right. If there’s not, pick a different font from the “Font” list. 6. 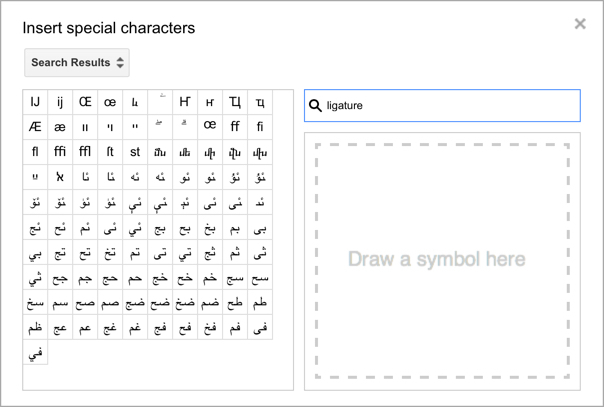 Somewhere in the characters displayed will be some ligatures, probably fi and fl but maybe others as well. Click one of them, then click “Insert." 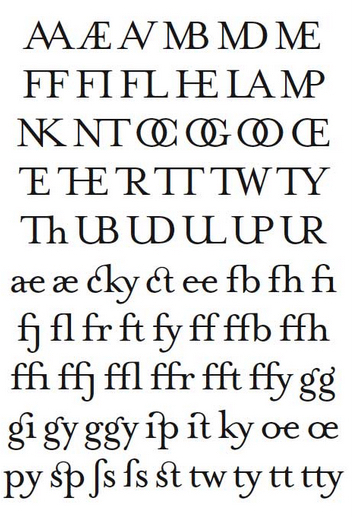 Now you can do your typographical best! 1. When searching for evidence, don't forget about checking the primary sources yourself! As you see above, it's pretty straightforward to get pages of text from different time periods by search in Google Books and limiting the date of the books. As you can see from the above sequence, capitals varied a good bit over time. 3. When searching for the history of something, be wary of received folk wisdom. Be careful when looking through your sources--you really want something that's credible and provides a story that you can second source someplace else. 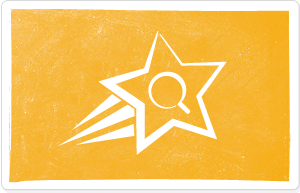 Search Challenge (8/19/15): Why all the crazy capital letters? ... it becomes necessary for one person to understand something strange, weird, or unexpected, they often turn to a Search Engine. And with that Sentence, I illustrate the Challenge for today. As you probably noticed, my use of capital letters was a bit odd in the preceeding couple of sentences. These days, we understand what gets capitalized: Initial letters of sentences, proper names, words for emphasis, and specialty terms (e.g., "Search Challenge"). Note where the capitals are in those few transcribed sentences: "Declaration" and "State of America" (and most notably, not "united"). But notice the pattern of capital letters. In the Archives.gov version, "Events" isn't capitalized, but "Course" is! On the other hand, in the earlier version, lots of other words get capitals (highlights in pink rectangles). Course, Events, People, Political, Powers, Earth, Station... they're all capitalized. And then there are all of the little "connectors" that link two letters (some of which are pointed to by my red arrows). What's up with that? As is our Usual Practice, please let us know HOW you found the Answers in the comments below. Let's talk about the simplest first. 2. What are these posts for? 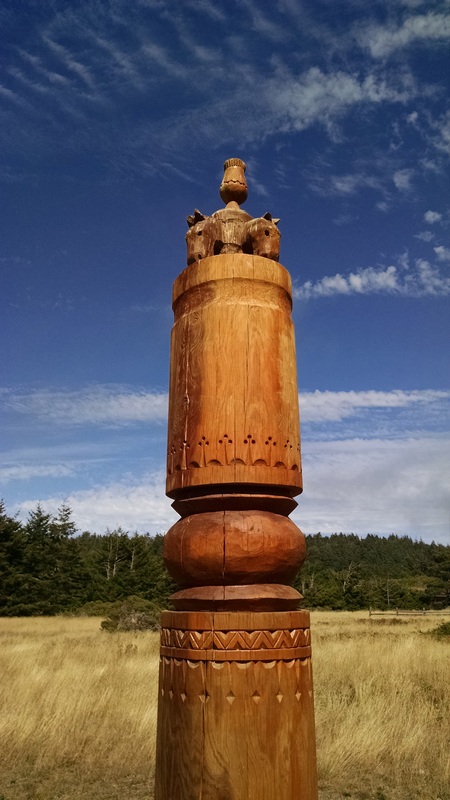 Who built them, and why? Click on each of these images to see the photo in full resolution. 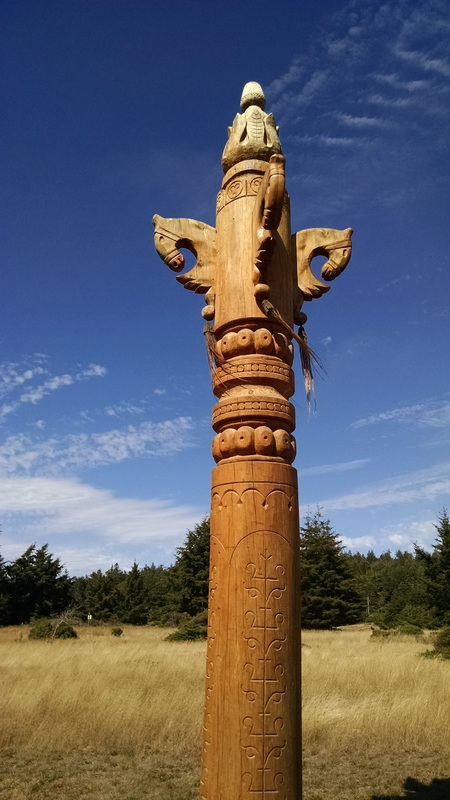 The carvers are from Sakha, a region of Russia that is roughly the size of India, but holds only about 100K people. The Yakuts people are from Sakha, and were early settlers in this part of California in the 1820s where they hunted and did lots of work with other Russian immigrants, trappers, and traders. In any case, this wasn't too difficult to figure out. Search Lesson: When searching for a localized target, grabbing the EXIF metadata with lat/long and THEN searching for other obvious features (e.g., the name of the park the target is located within) can lead to a rapid resolution. Be sure you know how extract EXIF from image--it's immensely handy. HOWEVER... the mystery of the first Challenge from last week continues to grow. WHAT IS THIS THING? As you recall, Elin told us the story of having seen a striking optical device when she was just a kid in Denmark, and wondered if we could help her find it. So far.. we haven't had success. 1. WHAT is the name of this device that Elin describes? Can you figure out who made (or still makes) them? And since this is so up-in-the-air, I'm going to leave this Challenge open for a bit longer. Like many of you, I've been poking various Danish friends, hoping that someone will know a Danish optician or ophthalmologist, OR someone can connect me with a Danish museum of optical instruments. I've even tried searching .DK site in Danish (using Google Translate to give me query terms like antik Optiker enhed , and Optiker udstyr... but those didn't pan out. I suspect that some of the clues we've found (e.g., the cobalt blue background, or the image of the keratometer) will be useful... we just don't know how yet. So, carry on SearchResearchers! Neither I nor Elin know the answer.. yet! that might have been found in a Danish opticians office past Elin over the weekend. Here is the one that she said seemed most-like the one she remembered. 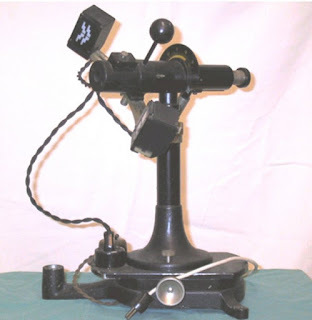 This is a keratometer from the 1950s. In particular, it was a monocular device. The biggest difference is that Elin recalls seeing blue and red rings, a bit like the duochrome test. One optometrist's page tells us that the duochrome test is often red-green, but that blue may be substituted for green on occasion. That same page also tells us that circles are sometimes used in the test, and they're called Verhoeff's Circles. Don't know if this will solve the Challenge or not, but I thought I should give you this additional clue! ... Challenges come from friends who are Googlers (so they've already done their own searching on the topic), and who are still stumped by what they seek. Difficult Challenges are also characterized by not knowing where to start. That was the case a couple of weeks ago with the oddly-shaped industrial roof-line, and it's definitely the case when you're searching for something that's NOT in your own culture. In Search Challenges like this, you literally don't know where to start, and that makes the searching harder than usual. Two we have two Challenges, one that's difficult (from a Danish Googler friend) and one that's pretty straightforward, but also comes from another culture. I am looking for the name (and detailed function) of an instrument I remember from my childhood, in early 60s. Back then, it was common that opticians had this mounted on their storefront window, for the education and amusement of bypassers on the sidewalk, and most likely also to bring people into buy new frames and lenses. When you looked, with one eye at a time, into a scope, you would see colored circles, I think it was a blue circle with a larger red one behind. Deformity in the circle was an indicator of astigmatism (as far as I remember), but perhaps there were other aspects as well. I have asked around among people aged 50-60, but no Americans seem to have experienced this. Some Danes and Germans remember this, growing up in urban cities with lots of store fronts. But nobody seem to remember the name and exact functionality. 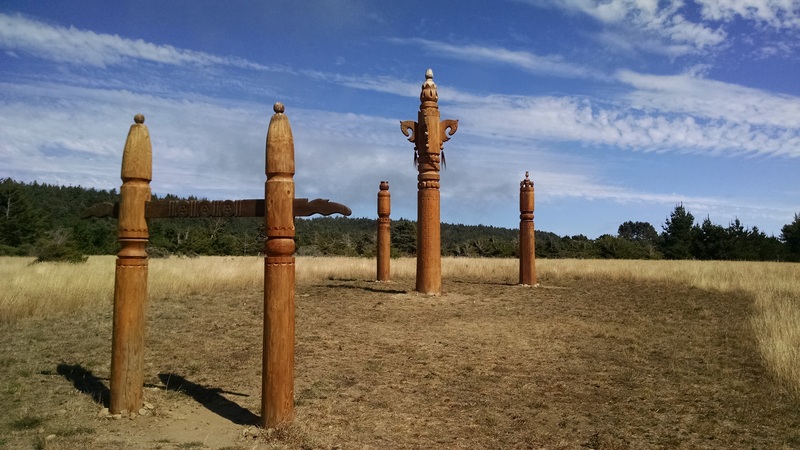 You can see why I was so astonished at running across these posts, kind of in the middle of an open field. What? How? And furthermore, Why? Remember to let us know HOW you found the answer, what you did to make your research path work out! ... the updated version of the PowerSearchingWithGoogle.com course. As you might guess, it's a lot of work to pull all of this content together, making the videos, writing the content, and so on. I'd like to make it as available as possible to the most people. So, below I've put all of the videos from that course into an easy-to-use table. This is the master list of videos along with a short description of the topic for each. They’re all around 5 minutes long, so any of them are easy to work into your program. And best of all, they’re all labeled as Creative Commons CC BY-NC, so go wild! (The BY-NC label that means you can remix, tweak, and build upon these videos non-commercially; note that your new works must acknowledge my original work (a link is fine), and be non-commercial). The texts and slides will are still in-process, but I'll post a link to them in the blog as well (just as soon as I finish them up). Answer: Whither the foggy weather?